You know what’s fun? Turning things over to the girls and letting them invent, create, and have fun. When we found out that Tinkerlab was having another Creative Challenge for kids, we were all in. The challenge this month, eggs. What can you do with eggs? 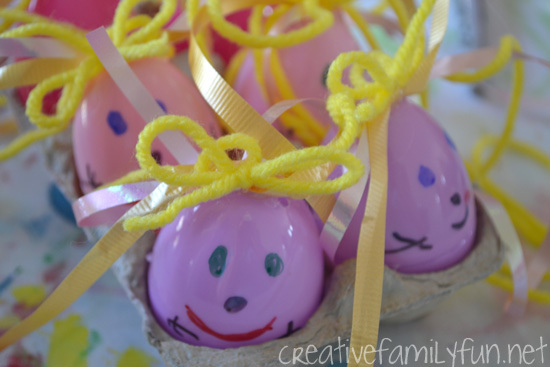 We made plastic egg bunnies and people too! 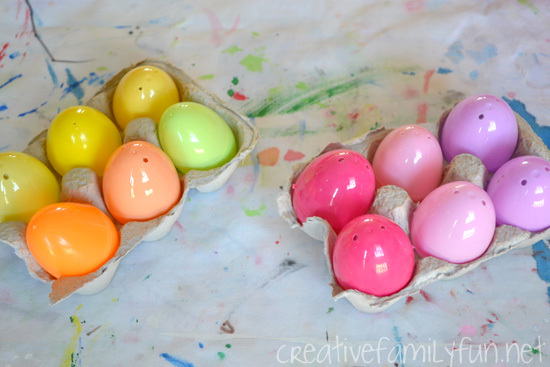 I began by pulling out our (way too) large collection of plastic eggs. I asked my girls what they would like to make with the eggs. They could turn them into something. They could use them to make art. Or, they could even make a game. The first thing they wanted to do was have an egg hunt. They love egg hunts. But, I wanted them to think beyond the typical use. I nudged them past that idea and promised them lots of egg hunts up until Easter. Now that that was settled, they moved on to bigger things. In the end, Miss First Grader wanted to make egg girls and Miss Preschooler wanted to make bunnies. We talked about the items we needed and ended up with yarn, ribbon, and Sharpies. 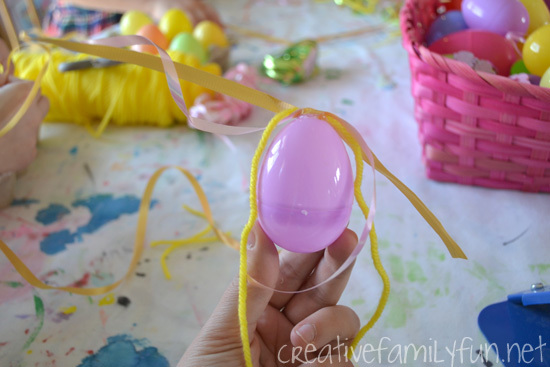 I got out the glue gun so we could attach the ribbon and yarn to the eggs. The girls started creating. I was in charge of the glue gun. We only have a high heat glue gun and the girls really don’t like to use it. They ended up telling me where to put the glue and they did the rest. Once they were satisfied with their hair (or ears, or collars), they used the Sharpies to draw faces. The process was very simple, but the process was their own. They laughed. They tried drawing the “cutest bunnies ever.” They got creative. 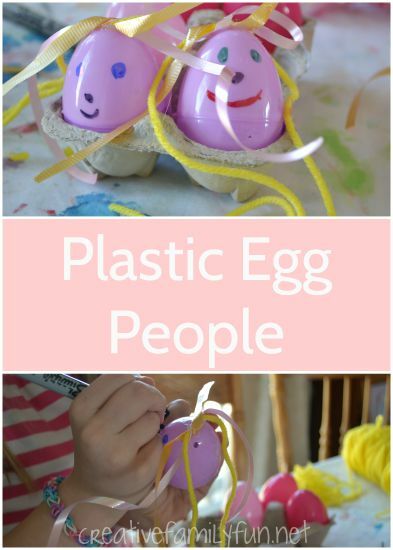 And, they had fun making their plastic egg bunnies and people. Who knows, maybe one of these days they’ll have their own crafty column here at Creative Family Fun! Do you want to follow along and see all the other great ideas? Stop by Tinkerlab by clicking the button below and check out all the creative kids. You can even link up your own! Cost: Under $5. 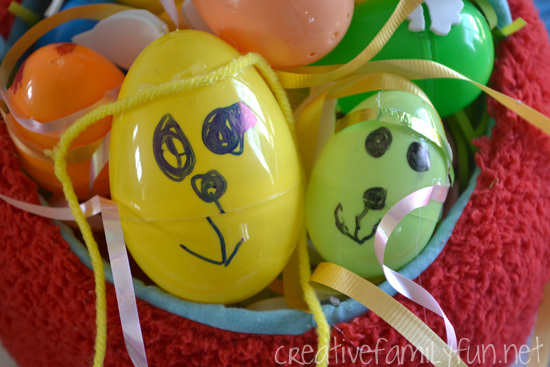 Plastic eggs are very inexpensive to buy if you don’t already have some extras. Planning time: 5 – 10 minutes to gather supplies and set up an area for creating. Ages: 5 and up. 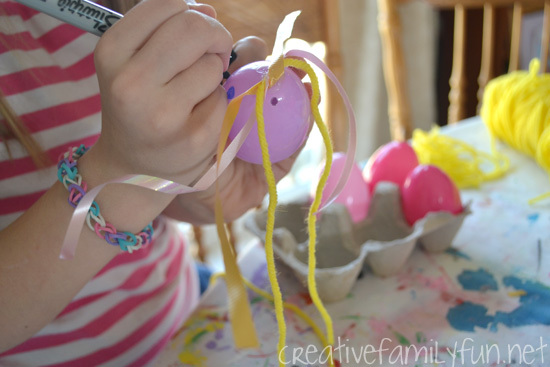 Make sure you have a grown-up helper or two if you’re using a glue gun. Time needed: At least 30 minutes. Have extra time available if everyone gets in a creative groove. To help move things along smoothly, set up creation stations. Have the loose parts in one area, the glue gun in another, and the markers in another. Have a grown-up sitting next to the glue gun to help the kids.